With the ability to automatically prioritize voice over Internet, the CM500V Cable Modem for Internet & Voice from NETGEAR is designed to ensure your phone calls get through. In addition to voice prioritization, this modem also supports a variety of calling features including 3-way conference calling, caller ID, call forwarding, and more. 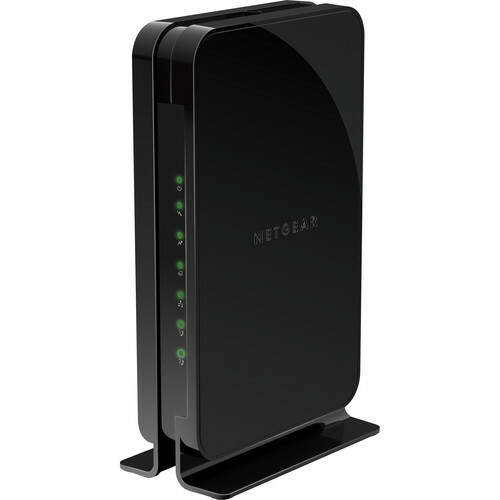 For the Internet user, this NETGEAR modem supports download speeds of up to 680 Mb/s and comes equipped with a single Gigabit Ethernet LAN port and a single coaxial cable connection. The NETGEAR CM500V Modem comes compatible with XFINITY from Comcast as well as other cable providers and is supported by both Windows and Mac systems. Box Dimensions (LxWxH) 10.1 x 7.6 x 3.8"
CM500V Cable Modem for Internet & Voice is rated 5.0 out of 5 by 2. Rated 5 out of 5 by Howard from No issues Allows full speed of cable service, phones work fine, no problems. Rated 5 out of 5 by Ken from Works great Easy install, works great. If it arrives on Feb. 5th, when will it ship? Once we receive the product from the vendor and we enter it into our inventory, it normally ships within 24 hours. Is the CM500V Docsis 3.0 or 3.1? B&amp;H # NECM500V is a DOCSIS 3.0. Does this work with optimum? can this modem stream 200 mb? I am currently using several old Western Electric 2500MM telephones on AT&amp;T POTS (Plain Old Telephone Service). These phones require current from the telephone office to operate. Furthermore these require a particular polarity.Can this modem operate with these old phones? The owners manual for the Netgear modem only states that the modem is equipped with RJ-11 jacks for the telephone connection. There are no additional specifications for telephone usage. You might want to try contacting Netgear, or you could just try using the WE 2500MM phones. If they don't work, then new phones are reasonably priced.